Mt Batur has large volcanic evident derived from the entire world geologists articles. Trip arrangement without expert’s scientific preparation can cause invaluable effort. For the dawn and the sunrise views, the earlier you reach the top, the better moment you have. In fact, Mt Batur is part of the International super volcanoes raised up 1717m from the center of the calderas, connected with the Pacific Ring of Fire networks which pressured up the volcanic material to the earth surface from the magma pocket; it formed dramatic double concentric caldera 13×10 km during its first emplacement and collapsed about 29300 years ago from the strato-volcano 3500m, another collapse occurred 20300 years ago formed the inner caldera lined into the lake. We are eagerly offering you daily memorable volcanic exploration to Mt Batur with several valued considerations. (Arrangement’s professionalism is importantly required due to get an expert or proper guide is uneasy collection). 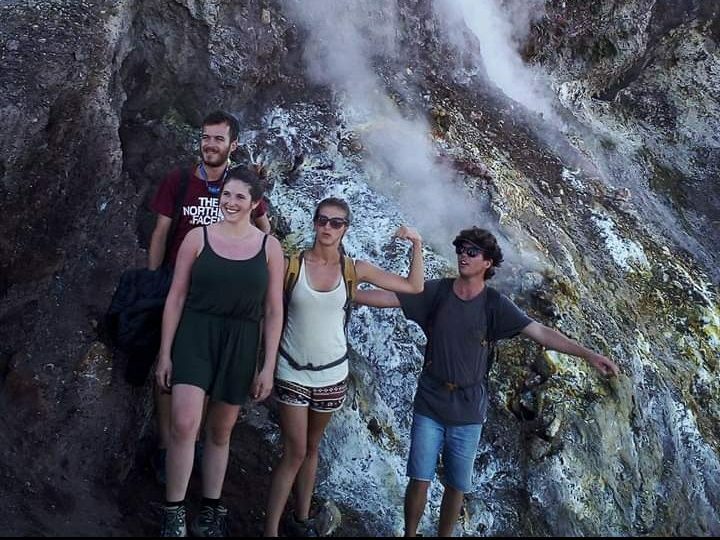 Our guides are assisting you in order to collect as much as information of volcanic eruption traces remained. This oriental morning adventurous is a special offer for you due to hike up to the original crater rim which has been currently erupted in 1849, the journey to the parasitic cones and lava fields. Magnificent views of mountains, Ocean and lake surroundings the island; Mt Agung, Mt Abang, Penulisan hillside and, other spectacular viewpoints are naturally fabulous. Sunrise and Mt Rinjani on Lombok are the twin great views synchronized to be a photographic object could be made from here for all types of Mt Batur Sunrise trip because this top is the first viewpoint; these viewpoints are including parts of the remaining calderas. After watching the sunrise, while the regular trips returning to the hotel, you are assisted to follow the similar trail with the semi-exploration trip but, it’s finally to be separated to another route down to the present parasitic cones which have been erupted in 2000s and several fast periods, there is also a great place for steaming eggs in the volcanic hot sulfuric hydrogen monoxide holes, most exited moment is entering the volcanic smoky steams at the latest parasitic cone. Volcanic Exploration is naturally and scientifically larger than Mt Batur regular trips which are organized by hundreds anonymous, formal and knowledge-lack; senior also junior at the entire Bali Tourist villages. The trail down to the lava fields tends to be smoother and not trodden countryside; moonlike sediment, pumiced shingles, sands and magmatic lava fields’ causes the trip is exiting and longer. Finally, trekking into the black lava field where an earlier village was disastrously destroyed by dark lava flows from the cataclysmic eruption in 1917-1961 emitted from the latest cones. Widespread lava fields introduce you the volcanic igneous, metamorphic & sedimentary rocks which flowed from the latest cones and presently mined by the local rock diggers for building construction. Important material from the volcanic sediments such several Cinder-Cones are attractively found presently, five minutes exploring one of the cinder cones on the last steps is unless attractive. Talking with any trip makers, if you are unfamiliar with, due to the most trip organizers are concerning to the regular Mt Batur Sunrise often annoying you and causes unequal transaction effort. For this reason, we suggest you to arrange your trip selectively in order to avoid the malpractice hassles. Carefulness, professionalism, friendliness and hospitality meet up assurance to our profiles. g.06:30 hot sulfuric hydrogen monoxide steaming holes, egg boiling testimony. k.09:15 ending the trek at Bukit Mentik and transfer to the hotel by 10:00. Price $ 65.
k.09:15 ending the trek at Bukit Mentik and transfer to the hotel by 10:00. Include: guide, breakfast, steamed egg, flashlight, transport & government tax. Exclude: insurance, trekking stick, pullover, cold drink, shoes and porter.